As virtual reality struggles to provide options that feel as robust as full games, one developer known for traditional platforming games has been staying up late at night taking every route it can think of to make sure anyone who selects Oculus Rift as their VR headset of choice has plenty to do – Insomniac, developer of games like Ratchet and Clank and Sunset Overdrive. I had the chance to check out two of their games on the Oculus and found two very different experiences awaiting me. 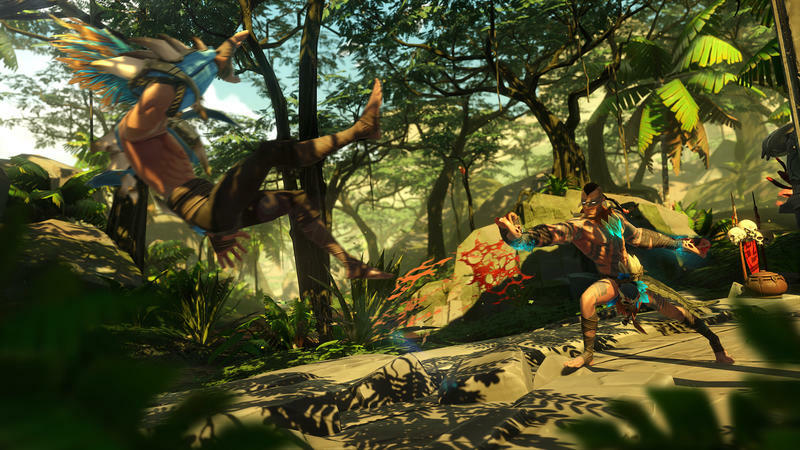 I checked out a third-person action game called Feral Rites, and a first person experience called The Unspoken. First, a note about the Rift itself. The question about whether it’ll fit your glasses and face is one people go back and forth on. While I can’t conclusively answer that question for you, I can provide some hard data: I wear Zero G Titanium San Francisco frames which measure around 140mm at outer edge of the frames. To make the Rift workable, I had to first take of my glasses, then slide them into the headset, and then put the headset on. Even then, it was a cramped fit compared to the more comfortable PlayStation VR headset. It fit, but it wasn’t great, and wearing it for a long time would’ve been headache inducing at the very least. But let’s talk about the games. While Insomniac is known for third-person titles, that’s not all they’re doing. 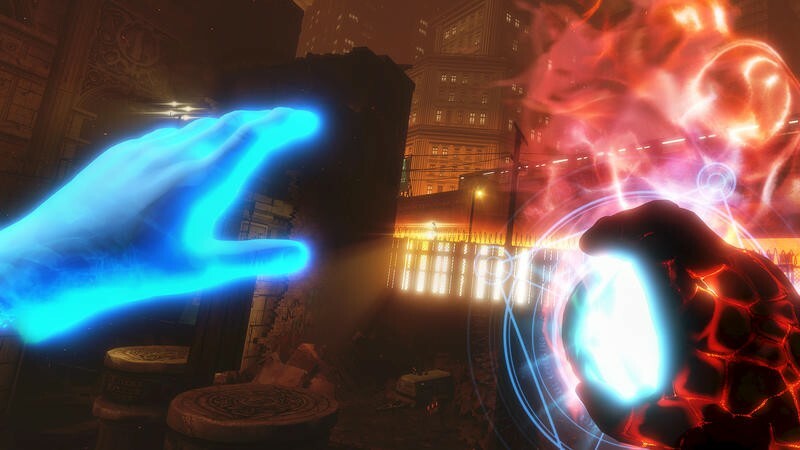 One of the games I checked out, The Unspoken, puts you in the spellcasting shoes of an urban mage caught in a heated duel with another, equally powerful mage. The draw of the concept is immediate and strong. 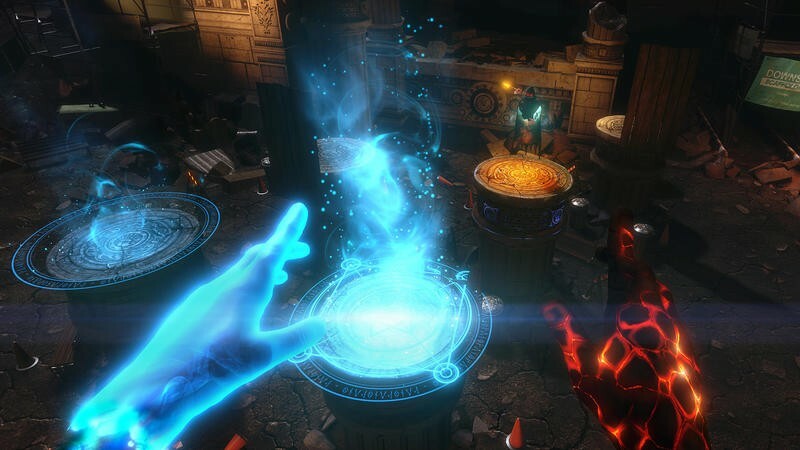 Creative director Chad Dezern said that the idea for the game appeared when the team first saw the Oculus touch controls – immediately they knew they wanted to cast spells with their bare hands. That led them out of their third-person comfort zone and into a first person game. The other big lightning bolt was the first time they tried out networked multiplayer VR for the first time. The team wanted to do something multiplayer focused, and this quirkiness added a new level of social interaction to the game. Instead of playing against someone’s character, you’re playing against someone. When the game releases, it’ll have over 25 different spells to cast. Each class has a pair of primary spells, one for each hand. I tried out the anarchist, which has a magic shield and fireball. The fireball is thrown like a ball, and moves pretty believably like one, arc included. There will also be abilities like telekinesis – Dezern’s favorite – and ultra-precise ‘Spectral Daggers,’ among other things. You can throw an electricity ball hadoken-style, use gestures to go into a defensive stance, and more. There are also what Dezern called Object Spells. For example, you can put a piece of paper out in front of you, fold it into a paper airplane, and then throw that, missile-style, at your opponent. You can also thrown an anvil out in front of you and hammer a spear into existence that can be used to break apart the columns you’ll teleport to throughout the match, affecting mobility and maybe even setting up traps. The game is very much focused on the duel idea, so the game’s small single player mode will serve mostly as a training ground for the multiplayer mode. It’s currently only one-on-one, but Dezern wouldn’t rule out the idea of bringing in additional players for a co-op battle at a later time. The team does have a backstory powering this game. In Chicago in 1893, the World’s Fair was the first time people saw electric lights and moving pictures, and they came away feeling like they’s seen magic. 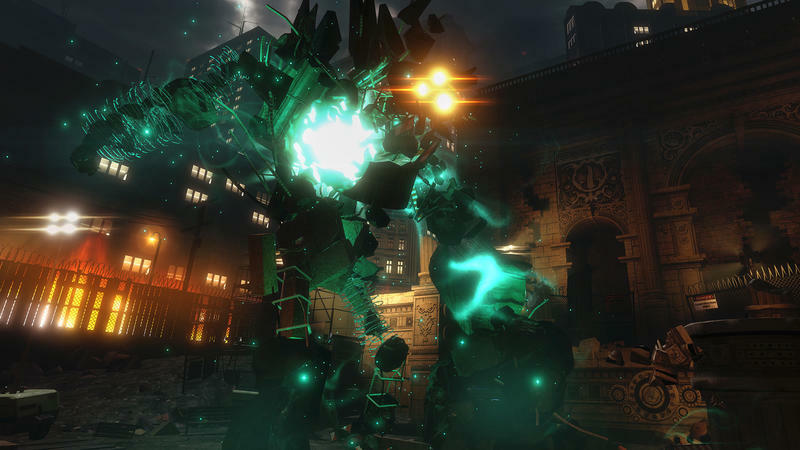 In The Unspoken’s world, it turns out they had seen magic, and that changes the world, bringing it up to the version of modern-day Chicago they’re presenting, a world filled with Hellblazer-style mages taking each other on in battle (That comparison is mine, not Dezern’s). I only tried out the one class I mentioned above, but stepped away wondering what the other classes might be like and what new abilities Dezern and his team might have in store. The game solves the problem of movement by letting you teleport, and this game feels like it could be played in any space where you have an arm’s span of space around you. I’m hoping the team will come up with some kind of competitive, scheduled tournament system to give the game’s competitive aspect a bit of structure. 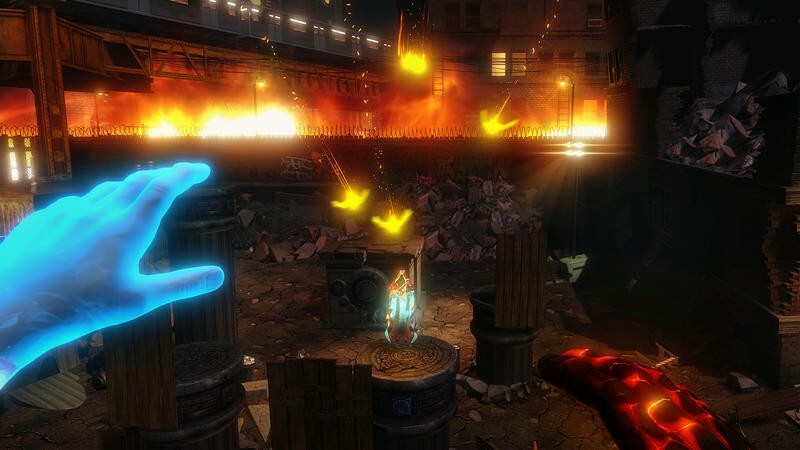 The Unspoken is expected to hit the Oculus store in Holiday 2016. While The Unspoken is a departure for Insomniac, Feral Rites is a departure from what most everyone else developing for VR is doing. Instead of going with the usual first person, Insomniac is putting together a third-person brawler, something much closer to the company’s usual bread and butter. The game is a bit different from the dev’s recently released Edge of Nowhere, also a third person game. 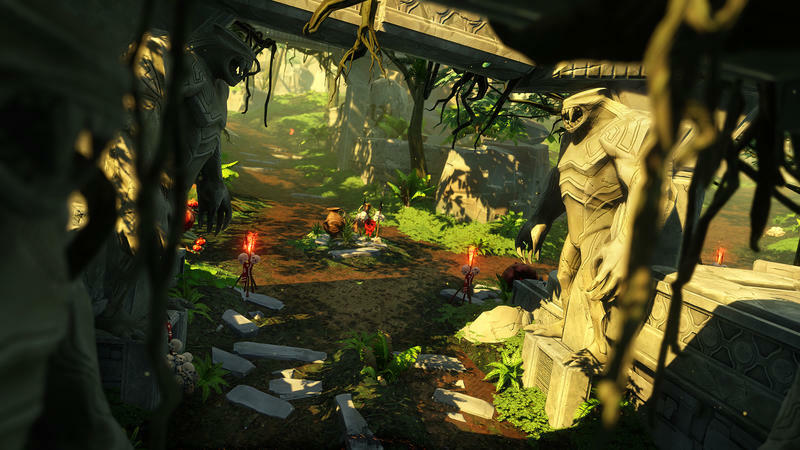 Where creative director Marcus Smith described Edge of Nowhere as a “beautifully curated game,” dependent more on canned experiences, Feral Rites is a system-based game. You play a native on an unnamed island that finds out the blood of the Jaguar family flows through them. Entering combat allows the character to transform into a jaguar beast, and throughout you’ll switch from Human to Jaguar and back. The game is meant to be a combo-based game, where you’re switching forms, juggling enemies, and racking up the most points. The demo I played, admitted Smith, didn’t do a very good job of conveying this, and I mostly just mashed my way through the demo area. Rewarding the player for this both immediately in game and outside with something like a leaderboard will be important to helping give the game life, and player rewards are something the team is still experimenting with. The demo I played featured a combo counter, but the team is experimenting back at the studio with a point-based combo system, so while the fighting mechanics and visuals are pretty well complete, the experience I had isn’t a final one by any means. One of the more interesting aspects of the game was the camera. Where Edge of Nowhere featured a follow-style camera and The Unspoken is a first-person game, Feral Rites has a locked overhead camera. As you switch scenes, you (as the camera) are placed somewhere above the map, and you can look all around you as much as you want, but you can’t change your position. This, weirdly, feels like a bit of a throwback to older games. Edge of Nowhere‘s follow camera had the problem of causing some players to experience simulator sickness. The team looked at games like Mario 64 and the like before deciding on a fixed camera to prevent that discomfort. 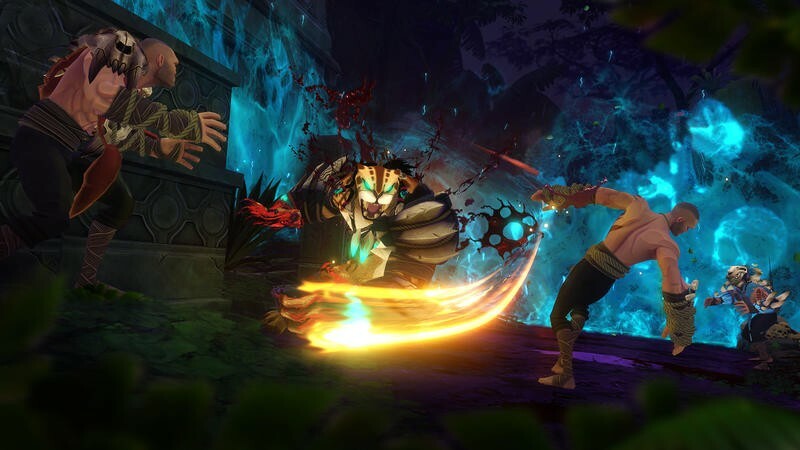 Like Edge of Nowhere, Feral Rites is meant to be a more traditional experience, and Smith says that the game is currently taking testers anywhere from 12-14 hours to complete, and expects first time players to take longer. While you only have access to the one beast, the Jaguar, there will be leveling via combat and gear to mix up the experience. 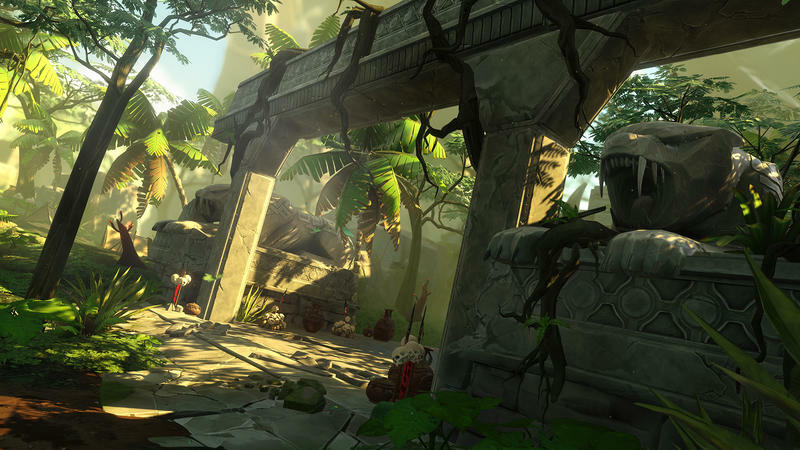 Feral Rites is expected to hit the Oculus store this fall.